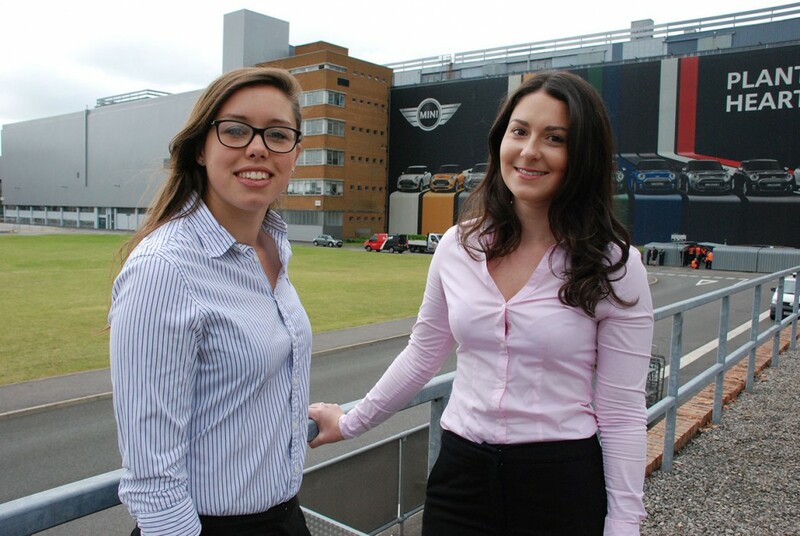 Two female engineers from MINI Plant Oxford have secured national recognition after they landed a top industry award from leading automotive magazine Autocar. Philippa Napier and Rachel Neary have been named in the ‘Rising Stars’ category of the ‘Great British Women in the Car Industry’ initiative, which is run by Autocar in partnership with the Society of Motor Manufacturers and Traders (SMMT). Philippa, 22, from Thame in Oxfordshire, is a final-year engineering technician apprentice at MINI Plant Oxford. She has had a passion for cars since a young age and achieved her ambition to enter the automotive profession following a stint of work experience at the plant. This led on to her winning a place on the company’s apprenticeship scheme, which has included taking a foundation degree in electrical and electronic engineering. Following her graduation Philippa will start her manufacturing career as a quality parts manager, which will see her supporting all quality related functions throughout the product’s lifecycle on the plant. Philippa said: “It’s really rewarding to be recognised in this way and so I’m delighted to have made the list. Initiatives like this are so important in raising awareness of female achievement in our industry and getting more of us to consider a career in engineering. Rachel Neary, 25, from Liverpool, joined the plant as part of the BMW Group’s graduate scheme back in 2013 after securing a first class Master’s degree in Physics from the University of Liverpool. She has already held roles at the Research and Innovation Centre in Munich and at Werk Leipzig, one of the BMW Group’s most progressive plants and home of electric BMW i car production. In Oxford, Rachel is now part of MINI’s production steering team, which manages the transformation of sheet metal to painted body. Rachel said: “I’m really excited and proud to be named in the Autocar Rising Stars list – it is a brilliant motivator to be recognised in such a way at the start of my career. It’s always been my ambition to be involved in the automotive industry and I’ve long been fascinated with cars, how they work and how they’re made. BMW Group UK is passionate about getting more females into the industry. As well as apprenticeship opportunities, each year the company runs a unique scheme for young women to get the chance to follow MINI production from body panels and engine building, to a completed car rolling off the line as part of its ‘Girls Go Technical’ programme. The programme is an exciting opportunity for young women aged 15-24 to experience the day to day challenges encountered by our engineers and technical apprentices in our state-of-the-art, world class plants in Oxford, Swindon and Hams Hall. Four days are spent at the heart of our manufacturing operations to gain an in-depth awareness of manufacturing and engineering processes, an insight into the range of careers available, including technical roles, as well as the chance to enhance interview and job application skills. Applications for February 2017 Girls Go Technical placements will open in the Autumn.